Several authors report on the prevalence of HBV among sub-populations in Nigeria with estimates varying depending on population studied and methods used. However, there is no reliable national survey of HBV exposure in the average risk population and in subgroups most likely to benefit from early detection, surveillance, and treatment. Given this gap in our understanding of HBV in Nigeria, we performed a systematic review and meta-analysis to provide an accurate estimate. We hope that the information presented here will draw attention to HBV as an important cause of morbidity and mortality in Nigeria and will inform those interested in developing policies and programs for its control. PubMed, EMBASE, Institute of Science Information, Google Scholar, Scopus, and African Journal Online were searched from 2000 to 2013. The last search was performed on February 31 2014. The keywords Hepatitis B, Hepatitis B surface antigen, prevalence, Nigeria, and similar terms such as HBV, HBsAg, were crossed. References were reviewed to extend the search, and Nigerian content experts were consulted for additional materials. English language prospective cohort studies and surveys published from 2000 to 2013 were included. Articles that assessed the prevalence of HBV in voluntary blood donors, pregnant women attending antenatal clinics, and in the general population were used. No age restriction was imposed. Children were defined as those of 12 years and below, adolescent as those aged 13-17 years while adults were defined as those of age 18 years and above. Studies were pooled using the DerSimonian-Laird method of random effects meta-analysis to estimate overall and sub-group specific prevalence. ,, Heterogeneity of results was determined by inspecting graphical presentations and calculating Cochran's Q test. The low, medium and high heterogeneity was predefined as a Cochrane Q of 25%, 50%, and 75%, respectively. , Meta-regression was used to determine potential confounders. The model included study level characteristics such as year of study, region, population, age, and method of HBV screening. Results were expressed as percentages with 95% CIs. 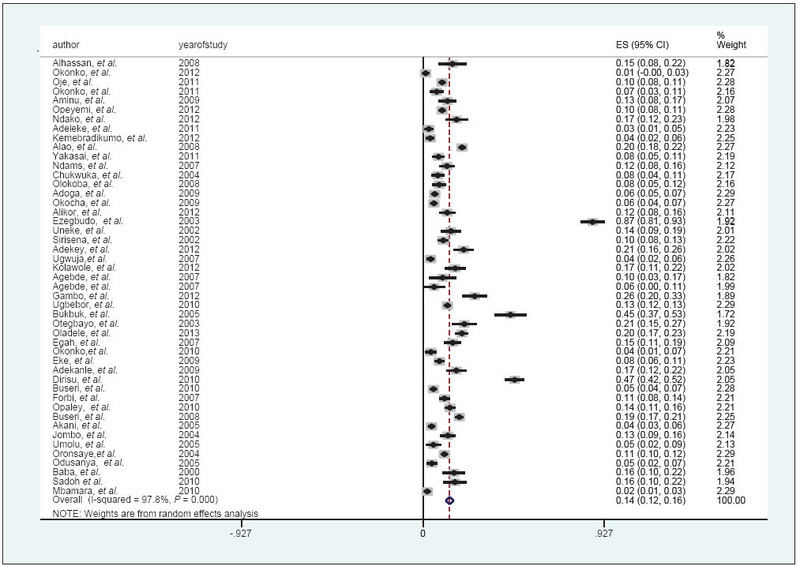 Publication bias was appraised with Egger's and Begg's adjusted rank correlation test and graphically depicted by a funnel plot. Publication bias was dealt with using the Trim and fill method; which is, a rank-based data augmentation technique. It ratifies the use of funnel plots, estimating the number and outcomes of missing studies and adjusting the meta-analysis to incorporate the theoretical missing studies. The level of significance was set at P < 0.05. All included studies were pooled for meta-analysis. The prevalence of HBV infection ranged from 0.5% to 46.8% among analyzed studies. The pooled prevalence estimate for Nigeria was 13.6% (95% confidence interval [CI]: 11.5, 15.7%) [Figure 2]. Assuming Nigeria has an estimated population of 160 million people, the overall HBV burden based on our estimates would be 21,760 million sero-positive persons (95% CI 18,400 000, 25,120 000). Stratified analysis showed a wide variation in the prevalence of HBV exposure based on study population, year of study, region, and age category [Table 2]. HBV prevalence was greatest among pregnant women attending antenatal clinics 14.1% (95% CI, 9.6, 18.6%) followed closely by voluntary blood donors 14.0% (95% CI, 11.7, 16.3%). The highest prevalence occurred in 2003 at 53.9% (95% CI, 10.3, 118%) and the lowest in 2011 at 7.0% (95% CI, 6.3, 11.6%). HBV prevalence was estimated to be 14.0% (95% CI, 11.6, 16.5%) among adults and 11.5% (95% CI, 6.0, 17.9%) among children. Prevalence was slightly greater for Northern Nigeria at 14.7% (95% CI, 11.4, 17.0%) compared with 13.6% (95% CI 11.5, 15.7%) for Southern Nigeria. 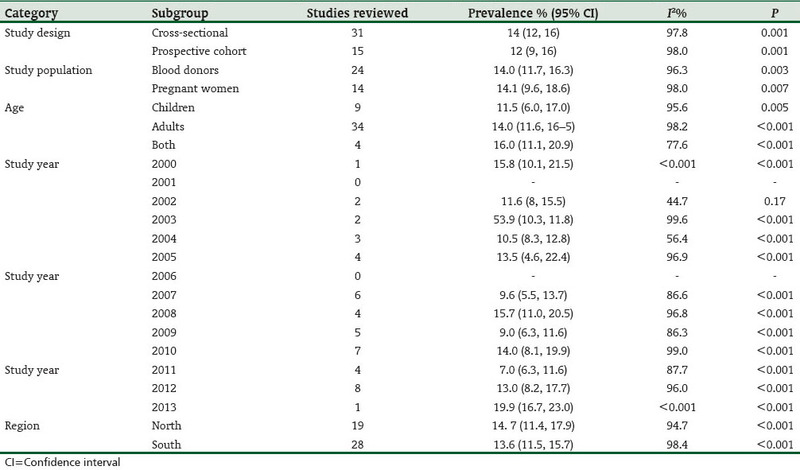 HBV prevalence also varied by screening method, [Table 3]. Among all populations, the HBV prevalence was estimated as 12.3% (95% CI, 10.1, 14.4%), 17.5% (95% CI, 12.4, 22.7), and 13.6% (CI, 11.5, 15.7) by using enzyme link immunosorbent assay (ELISA), immunochromatography (ICT), and HBV DNA polymerase chain reaction, respectively. Only one study additionally reported on HBeAg, with 4(2.3%) reported for both HBsAg and HBeAg positive; while none of the studies commented on HBV phase activity. Meta-regression analysis did not show that study year, region, population, age, or method of screening confounded prevalence estimates. However, this analysis suggested that HBV prevalence decreased by 0.8% annually [Figure 3]. There was evidence of publication bias with Egger's test having a P = 0.007, whereas Begg's test had a P = 0.0001. 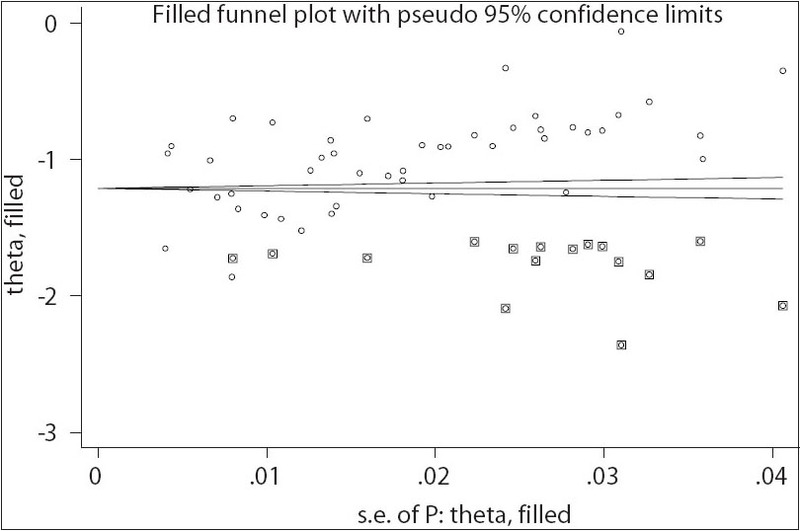 This was depicted graphically by a funnel plot which incorporated the Trim and filled method. It showed asymmetry of prevalence reported by various studies. Prevalence reported in reviewed studies were represented by diamond points, whereas augmented data point derived based on the trim and fill method are indicated by the addition of a square placed around the data symbol [Figure 4]. Nigeria has made notable gains along the four-prong strategy, for example, by registering hepatitis-related cancer cases, creating national guidelines for prevention of infection in health care workers, adopting universal vaccination, and screening all donated blood. However, national policies aimed at prevention of mother to child infections and elimination of HBV are lacking; this is perhaps reflected in our finding that approximately 14% of Nigerians were exposed to HBV from 2000 to 2013. This estimate would place Nigeria as one most affected countries in Africa and indeed the world. The prevalence peaked at 53.9% in 2003, although this estimate was weighted by only two studies. Nigeria has multiple challenges of terrain and treasury, making an accurate evaluation of HBV carrier rates extremely difficult. The country is vast and diverse; with its semi-arid plains and plateau in the north, the highland and coastal plains in the south; the dispersion of much of its population among rural areas, and the perennial challenge of resources. Thus, the findings of our study are important for policy formulation pending the conduct of a national sero-prevalence survey. The variation noted between sub-populations may have resulted from differences in the risks of acquisition of HBV infection and unmeasured socioeconomic and environmental factors across Nigeria. In the past, there were practices that increased the risk of HBV infection such as mass childhood circumcision in the north; even though, it's still been practiced in some rural areas. Similarly, there is usage of local unsterilized blades for commercial barbing services and use of unsterilized tools for facial marks and tattoos. Encouragingly, our meta-analysis suggests that there is a sustained decline in the prevalence of HBV infection over the last 13 years. A similar pattern has been observed in other African countries like Gambia and Senegal where the HBV prevalence rates have declined progressively from 10-0.6% to 18.7-2.2%, respectively. The observed decline in HBV prevalence in Nigeria may be related to a gradual increase in HBV vacation among children. In 2000-2005, HBV vaccination coverage was reported as zero by UNICEF, 18% in 2006, and peaked at 41% in 2013. While most recently reported coverage level is low by the worldwide average, the impact can be magnified with a rapid reduction in HBV prevalence. This type of response was demonstrated in the Gambia. Therefore, incremental efforts and even small scale efforts aimed at HBV prevention and control are likely to have great benefit. Nigeria is one of the countries with the highest population in the world; with children and young adults constituting the bulk of these numbers. It is also a low-middle income nation, with gross national income per capita purchasing power parity (PPP) of $2290. Moreover, it has relatively low life expectancy at birth of 54 years. It is also the country with the third highest burden of HIV in the world. While HIV has decimating effect on the socioeconomic fabric of the country; HBV could lead to chronic liver disease and cancer of the liver and ultimately early death marked by loss of able-bodied young adults. Both diseases are share common means of transmission. There have been positive results following various interventions aimed at curbing the burden of HIV in Nigeria as evident by a sustained decline in HIV prevalence. Thus, it should be envisaged that proper implementation of interventions such as early immunization and screening of high risk groups could further reduce HBV burden as well as improve Nigeria's socioeconomic indices. The accuracy of detection for active HBV infection depends on the screening method. Additional markers such as HBV Igm and HBV core antigen must be used to distinguish past infection from active infection. DNA testing, conversely, detects the presence of hepatitis even before the appearance of antibodies. Most included studies used ELISA for HBV screening. ICT is less sensitive than ELISA and thus yield false positives. This could explain the discrepancy in HBV prevalence between ICT compared to other methods in our analysis. Further, reporting over a 13-year period, we may have included studies using different generations of screening kits and thus their sensitivity and specificity may have varied. Our analysis showed that HBV prevalence was hyperendemic among women. Data in this population were limited as HBV estimates were sourced from hospital-based antenatal care that represents only a fraction of all antenatal care received by women. Further, our analysis included more studies reporting on HBV prevalence in males than women. Therefore, it is possible we underestimated the true prevalence in this population. Our study suggests that the HBV is hyperendemic in Nigeria. It underscores the need for universal vaccination of all children and the development of policies to prevent mother to child transmission. Our work is useful for planning interim national control strategies to combat hepatitis B infection as well as providing a robust basis for ultimately organizing hepatitis B national prevalence surveys and control measures. World Health Organization. Hepatitis B and C, Immunization, Vaccines and Biologicals. 2013. Available from: http://www.who.int/immunization/topics/hepatitis/en/. [Last accessed on 2013 Nov 18]. Ola SO, Odaibo GN. Alfa-feto protein, HCV and HBV infections in Nigerian patients with primary hepatocellular carcinoma. Niger Med Pract 2007;51:33-5. Lesi OA, Kehinde MO, Omilabu SA. Prevalence of the HBeAg in Nigerian patients with chronic liver disease Nig Q Hosp Med 2004;14:1-4. Ndububa DA, Ojo OS, Adetiloye VA, Durosinmi MA, Olasode BJ, Famurewa OC, et al. Chronic hepatitis in Nigerian patients: A study of 70 biopsy-proven cases. West Afr J Med 2005;24:107-11. Cutts FT, Izurieta HS, Rhoda DA. Measuring coverage in MNCH: Design, implementation, and interpretation challenges associated with tracking vaccination coverage using household surveys. PLoS Med 2013;10:e1001404. Rainey JJ, Watkins M, Ryman TK, Sandhu P, Bo A, Banerjee K. Reasons related to non-vaccination and under-vaccination of children in low and middle income countries: Findings from a systematic review of the published literature, 1999-2009. Vaccine 2011;29:8215-21. GAVI Alliance. Country Tailored Approach for Nigeria 2014-2018; 2014. Available from: http://www.apps.who.int/immunization_monitoring/globalsummary/estimates?c=NGA. [Last accessed on 2014 May 27]. Ola SO, Otegbayo JA, Odaibo GN, Olaleye OD, Olubuyide OL. Serum hepatitis C virus and hepatitis B surface antigenaemia in Nigerian patients with acute icteric hepatitis. West Afr J Med 2002;21:215-7. Emechebe GO, Emodi IJ, Ikefuna AN, Ilechukwu GC, Igwe WC, Ejiofor OS, et al. Hepatitis B virus infection in Nigeria - A review. Niger Med J 2009;50:18-22. [Last accessed on 2014 Oct 14]. Hamza M, Samaila AA, Yakasai AM, Musa B, Musa MB, Abdulrazaq GH. Prevalence of Hetatitis B and C virus infections among HIV-infections in a tertiary hospital in North-Western Nigeria. Niger J Basic Clin Sci 2013;10:76-81. Mbaawuaga EM, Enenebeaku MN, Okopi JA, Damen JG. Hepatitis B Virus (HBV) Infection among. Pregnant Women in Makurdi, Nigeria. Afr J Biomed Res 2008;11:155-9. Lesi OA, Kehinde MO, Omilabu SA. Prevalence of the HBeAg in Nigerian patients with chronic liver disease. Niger Q Hosp Med 2004;14:1-4. Habib AG, Yakasai AM, Owolabi LF, Ibrahim A, Habib ZG, Gudaji M, et al. Neurocognitive impairment in HIV-1-infected adults in Sub-Saharan Africa: A systematic review and meta-analysis. Int J Infect Dis 2013;17:e820-31. Barth RE, Huijgen Q, Taljaard J, Hoepelman AI. Hepatitis B/C and HIV in sub-Saharan Africa: An association between highly prevalent infectious diseases. 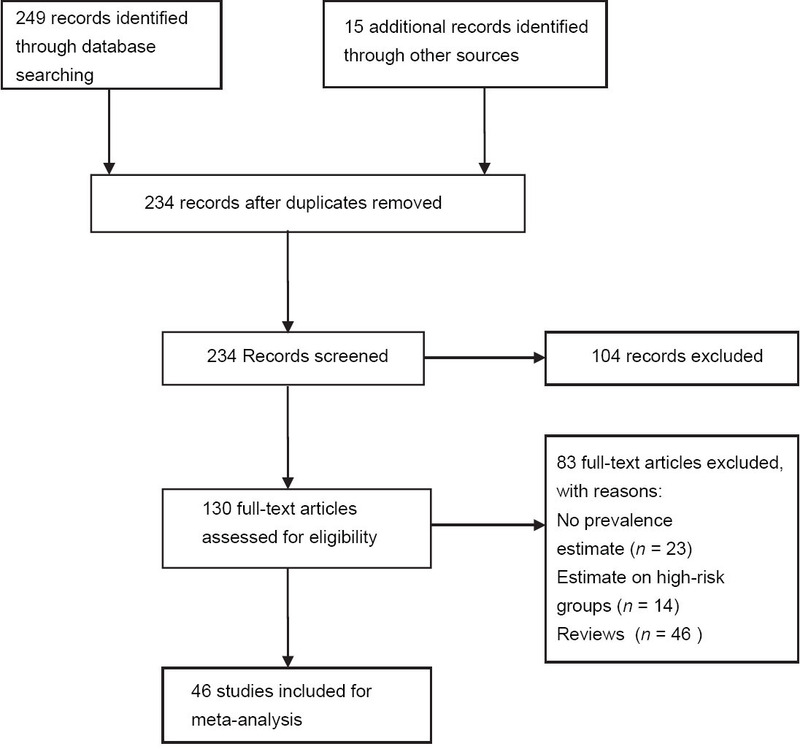 A systematic review and meta-analysis. Int J Infect Dis 2010;14:e1024-31. Haghdoost AA, Sadeghirad B, Hajarizadeh B, Mirzazadeh A. The application of systematic review and meta-analysis concepts in summarizing the findings of observational studies. Iran J Psychiatry 2007;2:132-6. Ado A, Alhassan S, Chonoko UG, Samaila AU. Sero-prevalence of hepatitis B surface antigen (HBsag) among blood donors attending Ahmadu Bello university teaching hospital (ABUTH), Zaria, Nigeria. Bajopas 2010;3:20-2. Okonko I, Okerentugba P, Innocient AH. Detection Of Hepatitis B Surface Antigen (HBsAg) Among Children In Ibadan, Southwestern Nigeria. Int J Infect Dis 2012;10. Available from: http://www.ispub.com/IJID/10/1/14183. [Last accessed on 2014 Oct 14]. Oje OJ, Sule WF, Famurewa D. Dual positivity of hepatitis B surface antigen and anti-hepatitis C virus antibody and associated factors among apparently healthy patients of Ekiti State, Nigeria. Viral Immunol 2012;25:448-55. David OM, Oluduro AO, Ariyo AB, Ayeni D, Famurewa O. Sero-epidemiological survey of hepatitis B surface antigenaemia in children and adolescents in Ekiti State. Niger J Public Health Epidemiol 2013;5:11-4. Ndako JA, Echeonwu GO, Nwankiti OO, Onovoh EM, Ujah A, Ikani PA, paul GA. Hepatitis B Virus Sero-Prevalence among pregnant females in Northern Nigeria. Res J Med Sci 2012;6:129-33. Adeleke S, Adebimpe MA, Sam-Wobo WO, Wahab SO, Akinyosoye AA, Adelowo TO. Sero-prevalence of malaria, hepatitis b and syphilis among pregnant women in Osogbo, Southwestern Nigeria. J Infect Dis Immun 2013;5:13-7. Kemebradikumo P, Isa I. The Sero-prevalence of Hepatitis B surface antigen and anti-hepatitis C antibody among women attending antenatal clinic at a tertiary health facility in the Niger Delta of Nigeria. Glob Adv Res J Med Med Sci 2013;2:006-12. Alao O, Okwori E, Egwu C, Audu F. Seroprevalence of hepatitis B surface antigen among prospective blood donors in an Urban Area of Benue State. Internet J Hem 2008:5. Available from: http://www.ispub.com/IJHE/5/2/3040. [Last accessed on 2014 Oct 14]. Ibrahim AY, Rabi'u A, Idris SA, Saidu AI. Sero-prevalence of hepatitis B virus infection and its risk factors among pregnant women attending antenatal clinic at Aminu Kano Teaching Hospital, Kano. Niger J Basic Clin Reprod Sci 2012;1:49-55. Ndams IS, Joshua IA, Luka SA, Sadiq HO. Epidemiology of hepatitis B infection among pregnant women in Minna, Nigeria. Sci World J 2008;3:5-8. Chukwuka JO, Ezechukwu CC, Egbouonu I, Okoli CC. Prevalence Of hepatitis B surface antigen in primary school children In Nnewi, Nigeria. Niger J Clin Pract 2004;7:8-10. Olokoba AB, Salawu FK, Danburam A, Olokoba LB, Midala JK, Badung LH, et al. Hepatitis B virus infection amongst pregnant women in North-eastern Nigeria - A call for action. Niger J Clin Pract 2011;14:10-3. Adoga MP, Gyar SD, Pechulano S, Bashayi OD, Emiasegen SE, Zungwe T, et al. 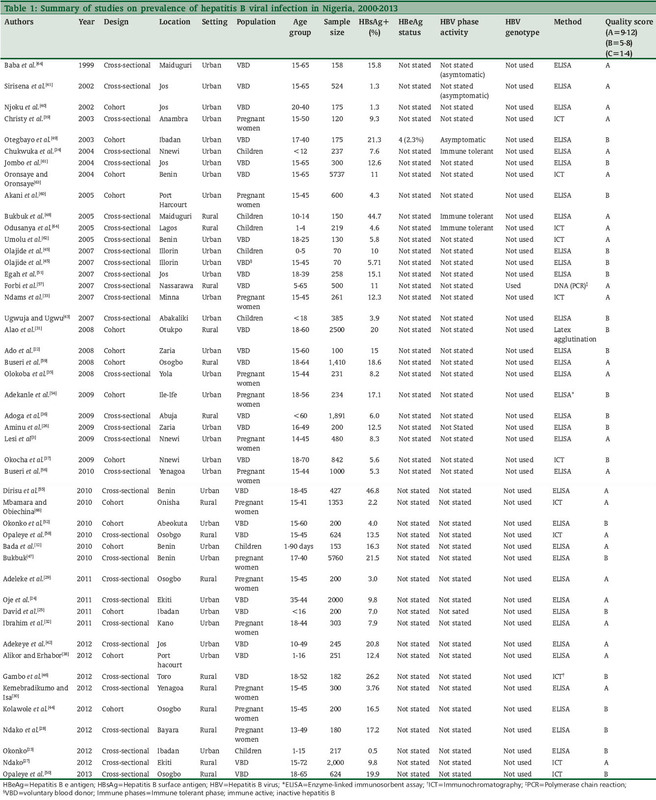 Hepatitis B virus infections in apparently healthy urban Nigerians: Data from pre-vaccination tests. J Infect Dev Ctries 2010;4:397-400. Alikor EA, Erhabor ON. Seroprevalence of hepatitis B surface antigenaemia in children in a tertiary health institution in the Niger Delta of Nigeria. Niger J Med 2007;16:326-9. Christy NE, Denis EA, Gilbert ON, Chidi UI, Matthias IA, Herbert OO, et al. : The Seroprevalence of Hepatitis B surface antigen and human immunodeficiency virus among pregnant women in Anambra state, Nigeria. Shiraz E Med J 2004; 5. http://semj.sums.ac.ir/vol5/apr2004/HIV_HBV.htm. [Last accessed on 2014 Oct 14]. Uneke CJ, Ogbu O, Inyama PU, Anyanwu GI, Njoku MO, Idoko JH. Prevalence of hepatitis-B surface antigen among blood donors and human immunodeficiency virus-infected patients in Jos, Nigeria. Mem Inst Oswaldo Cruz 2005;100:13-6. Sirisena ND, Njoku MO, Idoko JA, Isamade E, Barau C, Jelpe D, et al. Carriage rate of hepatitis-B surface antigen (HBsAg) in an urban community in Jos, Plateau State, Nigeria. Niger Postgrad Med J 2002;9:7-10. Adekeye AM, Chukwuedo AA, Zhakom PM, Yakubu RS. Prevalence of hepatitis b and c among blood donors in jos South LGA, Plateau State. Asian J Med Sci 2013;5:101-4. Ugwuja E, Ugwu N. Seroprevalence of hepatitis B surface antigen and liver function tests among adolescents in Abakaliki, South East Nigeria. Internet J Trop Med 2008:6. Available from: http://www.ispub.com/IJTM/6/2/8952. [Last accessed on 2014 Oct 14]. Kolawole OM, Wahab AA, Adekanle DA, Sibanda T, Okoh AI. Seroprevalence of hepatitis B surface antigenemia and its effects on hematological parameters in pregnant women in Osogbo, Nigeria. Virol J 2012;9:317. Olajide OA, Juliet OI, Mathew OK, Ajuawo A. Risk factors and prevalence of hepatitis B surface antiginaemia in mothers and their preschool age children in Illorin, Nigeria. Therapy 2007;4:67-72. Gambo IM, Rabiu, AM, Muhammad MB, Shugaba I. Seroprevalence of HBsAg among Fulani nomads in Toro, North-Eastern Nigeria. Glob Adv Res J Med Med Sci 2012;1:214-7. Oladeinde BH, Omoregie R, Oladeinde OB. Prevalence of HIV, HBV, and HCV infections among pregnant women receiving antenatal care in a traditional birth home in Benin City, Nigeria. Saudi J Health Sci 2013;2:113-7. Bukbuk DN, Bassi AP, Mangoro ZM. Sero-prevalence of hepatitis B surface antigen among primary school pupils in rural Hawal valley, Borno State, Nigeria. J Community Med Prim Health Care 2005;17:20-3. Otegbayo JA, Fasola FA, Abja A. Prevalence of hepatitis B surface and e antigens, risk factors for viral acquisition and serum transaminase among blood donors in Ibadan, Nigeria. Trop Gastroenterol 2003;24:196-7. Opaleye OO, Tijani BA, Zakariyahu TO, Taiwo SS. Prevalence of HBsAg and HIV among blood donors in Osogbo, Osun State, Nigeria. Int Res J Med Med Sci 2013;1:68-71. Udeze AO, Aliyu AS, Kolawole M, Okonko O, Sule WF, Akanbi K. Hepatitis B surface antigenaemia and risk factors O transmission among apparently healthy students of universit of Ilorin, Ilorin-Nigeria. Sci Afr 2012;11:1-8. Adekanle O, Ndububa DA, Ayodeji OO, Paul-Odo B, Folorunso TA. Sexual transmission of the hepatitis B virus among blood donors in a tertiary hospital in Nigeria. Singapore Med J 2010;51:944-7. Dirisu JO, Alli TO, Adegoke AO, Osazuwa F. A Survey of prevalence of serum antibodies to human immunodeficiency deficiency virus (HIV), hepatitis B virus (HBV) and hepatitis C virus (HCV) among blood donors. N Am J Med Sci 2011;3:35-8. Forbi JC, Vaughan G, Purdy MA, Campo DS, Xia GL, Ganova-Raeva LM, et al. Epidemic history and evolutionary dynamics of hepatitis B virus infection in two remote communities in rural Nigeria. PLoS One 2010;5:e11615. Opaleye OO, Zakariyahu TO, Tijani BA, Bakarey AS. HBV, HCV co-infection among blood donors in Nigeria. Indian J Pathol Microbiol 2010;53:182-3. Jombo GT, Egah DZ, Banwat EB. Hepatitis B virus infection in a rural settlement of northern Nigeria. Niger J Med 2005;14:425-8. Umolu PI, Okoror LE, Orhue P. Human immunodeficiency virus (HIV) seropositivity and hepatitis B surface antigenemia (HBSAG) among blood donors in Benin city, Edo state, Nigeria. Afr Health Sci 2005;5:55-8. Oronsaye FE, Oronsaye JI. Prevalence of HIV-positives and hepatitis B surface antigen-positives among donors in the University of Benin Teaching Hospital, Nigeria. Trop Doct 2004;34:159-60. Odusanya OO, Alufohai FE, Meurice FP, Wellens R, Weil J, Ahonkhai VI. Prevalence of hepatitis B surface antigen in vaccinated children and controls in rural Nigeria. Int J Infect Dis 2005;9:139-43. Baba MM, Onwuka IS, Baba SS. Hepatitis B and C virus infections among pregnant women in Maiduguri, Nigeria. Cent Eur J Public Health 1999;7:60-2. Mbamara SU, Obiechina NJ. Seroprevalence of hepatitis B surface antigen among antenatal clinic attendees in a private specialist hospital in Onitsha Southeast Nigeria. Niger Med J 2010;51:152-4. World Health Organization. Recommendations on Viral hepatitis 2010. Available from: http://www.apps.who.int/gb/ebwha/pdf _files/EB126/B126_R16-en.pdf. [Last accessed on 2014 May 31]. World Health Organization. Global policy report on the prevention and control of viral hepatitis. Available from: http://www.apps. who.int/iris/bitstream/10665/85397/1/9789241564632_eng.pdf. [Last accessed on 2014 May 31]. Sutton AJ, Abrams KR, Jones DR, Sheldon TA, Song F. Methods for meta analysis in medical sciences. England: John Wiley and Sons Ltd.; 2000. Opaleye OO, Oluremi AS, Atiba AB, Adewumi MO, Mabayoje OV, Donbraye E, et al. Occult Hepatitis B Virus Infection among HIV Positive Patients in Nigeria. J Trop Med 2014;2014:796121. Nna E, Mbamalu C, Ekejindu I. Occult hepatitis B viral infection among blood donors in South-Eastern Nigeria. Pathog Glob Health 2014;108:223-8. Firnhaber C, Reyneke A, Schulze D, Malope B, Maskew M, MacPhail P, et al. The prevalence of hepatitis B co-infection in a South African urban government HIV clinic. S Afr Med J 2008;98:541-4. Dongdem JT, Kampo S, Soyiri IN, Asebga PN, Ziem JB, Sagoe K. Prevalence of hepatitis B virus infection among blood donors at the Tamale Teaching Hospital, Ghana (2009). BMC Res Notes 2012;5:115. Fomulu NJ, Morfaw FL, Torimiro JN, Nana P, Koh MV, William T. Prevalence, correlates and pattern of Hepatitis B among antenatal clinic attenders in Yaounde-Cameroon: Is perinatal transmission of HBV neglected in Cameroon? BMC Pregnancy Childbirth 2013;13:158. World Health Organization. Hepatitis B Global Infection rate. 2006. Available from: http://www.pkids.org/files/pdf/phr/02-09 globalhbv.pdf. [Last accessed on 2013 Dec 22]. Rossi C, Shrier I, Marshall L, Cnossen S, Schwartzman K, Klein MB, et al. Seroprevalence of chronic hepatitis B virus infection and prior immunity in immigrants and refugees: A systematic review and meta-analysis. PLoS One 2012;7:e44611. Custer B, Sullivan SD, Hazlet TK, Iloeje U, Veenstra DL, Kowdley KV. Global epidemiology of hepatitis B virus. J Clin Gastroenterol 2004;38:S158-68. UNAIDS. HIV burden in Nigeria; 2008. Available from: http://www.unaids.org/en/KnowledgeCentre/HIVData/GlobalReport/2008. [Last accessed on 2014 May 31]. Kuhns MC, Busch MP. New strategies for blood donor screening for hepatitis B virus: Nucleic acid testing versus immunoassay methods. Mol Diagn Ther 2006;10:77-91. Weber B, Bayer A, Kirch P, Schlüter V, Schlieper D, Melchior W. Improved detection of hepatitis B virus surface antigen by a new rapid automated assay. J Clin Microbiol 1999;37:2639-47.